JMS provided construction support for Massachusetts Maritime Academy’s training vessel the T.S. KENNEDY (formerly the T.S. ENTERPRISE). The 540-foot long vessel was originally the SS VELMA LYKES, constructed by Avondale Shipyards for the Lykes Brothers Steamship Company in 1967. In 1986 she was placed into the National Defense Reserve Fleet (NDRF) under the ownership of the U.S. Department of Transportation Maritime Administration (MARAD) and was renamed the SS CAPE BON. 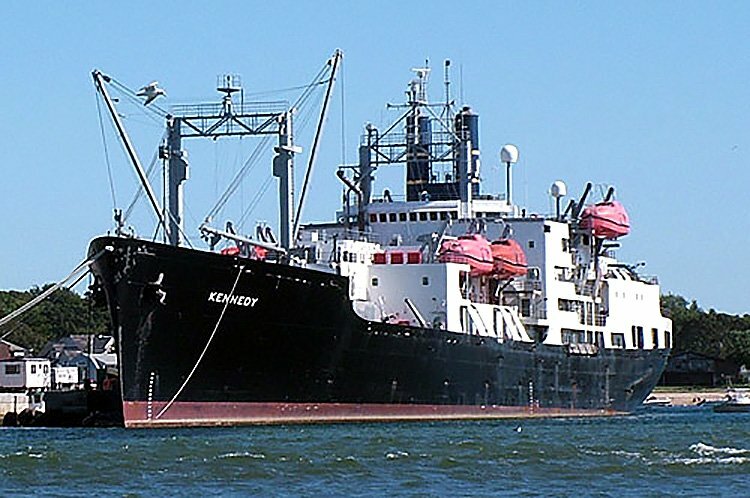 In 2002 The SS CAPE BON underwent a conversion to a “public nautical schoolship” at Bender Ship Repair and was commissioned to the Massachusetts Maritime Academy as the T.S. ENTERPRISE. JMS provided the marine engineering and design for converting the existing cargo space in #3 Hold, lower tween deck, to a berthing space for 90 cadets and the existing boat deck aft void space into staterooms for 18 officers. JMS provided drawings for the general arrangement, structure, electrical, HVAC, plumbing, and structural fire protection. JMS also provided the bidder’s specification for the project. Additional lifeboats were required to be installed to accommodate the increase in the ship’s berthing capacity. JMS prepared the engineering design and the contractor’s specification package for installing two Fr. Fassmer CLR C 6.4 70 person lifeboats/rescue boats and associated FPD 80 CLR 6.4 davit assemblies and replacing the existing ship’s fast rescue boat with a Fr. Fassmer model FRR 6.5 ID-SF fast rescue boat and associated PHRE 30 davit assembly. JMS also modified the existing exterior ladders in the area of the lifeboats to allow for a more efficient means of egress. A larger and more welcoming quarterdeck was designed to accommodate the 623 cadets, 102 crew as well as visitors aboard the vessel. The entire structural fire protection plan had to be revised to bring the 42 year old vessel to modern fire and life saving standards. Specifications and engineering drawings were developed for the replacement of bulkheads, insulation, overheads, and windows throughout the vessel. JMS also provided the engineering design services for the installation of an IMS type F12, fully electric operated, hydraulic sliding watertight door in the area of the vessel’s aft classrooms and replaced the existing shaft alley watertight door with an IMS type N-280, fully electric operated, hydraulic watertight door. Both doors were connected to the ship’s existing watertight door system. In addition, JMS modified two of the ship’s existing cargo oil tanks to sewage holding tanks and designed a sewage transfer system. The sewage transfer system will allow the ship’s engineers to transfer sewage from the ship’s existing marine sanitation devices (MSD) to the converted holding tanks while operating within U.S. coastal waters to comply with the new EPA vessel general permit (VGP) requirements. JMS documented the existing MSD system to submit to ABS and USCG in order to gain class approval for the system currently installed. JMS is also conducting a stability analysis on converting the existing cargo oil tanks, currently used as ballast tanks, to sewage holding tanks. All of the work was conducted pier side at Massachusetts Maritime Academy. The $10 million project lasted almost 12 months and had to accommodate cadet schedules and other vessel activities throughout the year.